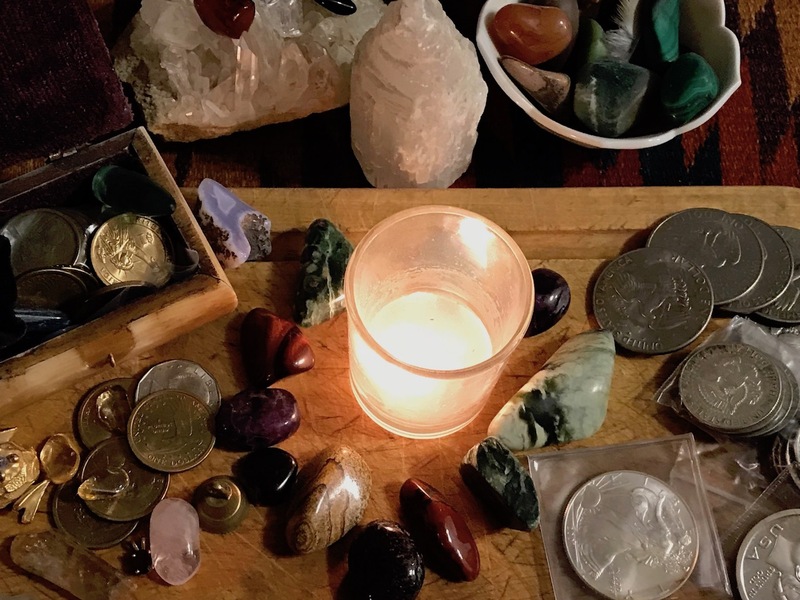 Today ~ Monday February 4, 2019 ~ is a New Moon, and Day 4 of my 'Illuminate Your Life' or 'Show Up Differently' challenge. I have been posting a video each day of the challenge, sharing my daily affirmation, and tips for helping overcome emotional triggers, and to more consciously respond to present moment challenges. Today's affirmation: I am living luxuriously! I am living according to my rhythms, in harmony with Nature, and the natural world, surrounded by beauty, and soon ~ on our (peace) of land in our beautiful home sanctuary. Typically, when we are 'triggered' by another person, or external event, we go into a spontaneous, instantaneous, trance-like state and unconsciously react (rather than consciously respond) from the unhealed wounds of a regressed part. If this continues to happen and go unchecked, we never learn to rise above these triggers, and in essence, we become a slave to them. The tools I learned from the Holistic C.O.R.E. Counseling process, created and taught by Dr. Martin Hart have proven valuable time and again. Dr. Hart has created a very effective system, or MAP to helping people become more conscious creators of their lives, and understand the messages that are showing up via our physical symptoms, and mental/emotional challenges. Once we can begin to connect the dots between our symptoms, and a greater conscious awareness of where in our lives we are in discord ~ living disharmoniously to our truer greater selves ~ we become more free. Essentially, we literally lighten up energetically, allowing us to more easily manifest, or align with our most illuminated, elegant, meaningful and joy-filled life path. I began this challenge while I was embroiled in an ongoing event that was definitely causing me to be triggered, and put these tools to the test. Thankfully, I have a couple people in my life that have been there to support me, and help me finally transcend my own charged emotions as this particular event, and specifically a particular person who was unrelenting in (their) continuing to keep it alive by making a private issue public. In the video below, Day 3 of the challenge, I explain what it means to get triggered and why, how it can feel, and how to begin to 'show up differently' by consciously responding versus unconsciously reacting. I have found these tools to be very powerful in helping myself and many clients overcome the haunting effects of the past, reclaim what was taken as a result of our earlier life slights, wounds, disappointments, loss, and traumas, and re-engage in life more uplifted, and more wholly integrated. We are essentially growing up our wounded, younger or lesser parts so that we can more easily flow, and evolve, and consciously manifest our greatest desires. In today's Day 4 video on the Strong Spirit Woman YouTube channel, I share 5 tips that can help you better deal with challenging situations or people in your life, and transcend the charged emotions that arise when triggered. I hope viewers will find the value in all that I'm presenting which forms the foundation of the 'work' I do as a certified clinical hypnotherapist, and Holistic C.O.R.E. Counselor/Educator. These tools, plus some very supportive people in my life are all helping me turn an unfortunate ongoing troubling experience into a great opportunity to learn more about myself, and become a better person. I am deeply grateful to not only my closest friends, spouse, and family that are supporting me in all ways, but I am grateful to the person who is the object of the recent challenges I have been enduring ~ all on the heels of having had quite an 'emptying out' or purging, post food poisoning, diarrhea. And as we have all heard, "nature abhors a vacuum." Well a vacuum was created and in my weakened state, I certainly let the wrong influences in, which began to poison my mind, or misjudge others in this particular situation. For more help getting from where you are, or Point A, to where you really, really, really desire to be, or Point B, C, D, or even Z...learn how in ten steps with The Strong Spirt Self-Empowerment Plan. In case you just joined me, below are the first three videos of this series. In the first video, I announce the challenge, the second video was my Day 1 affirmation and tips, and in the third video, I discuss how the imagination can be one of our greatest allies in manifesting our most illuminated life, or one of our greatest saboteurs.